2013 Site Awards: The Year's Best Articles, Videos, And More! 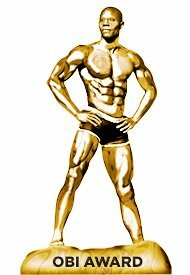 Every year the Bodybuilding.com Site Awards showcase the best content features and community contributors. Check out the top writers, articles, videos, photos, and more from 2013! The Olympia has the Sandow, the Academy has the Oscar, and Bodybuilding.com has the Obi! Every year, our Site Award winners receive an exclusive, limited-edition, totally digital, not-worth-any-money, not-real-gold statue! All hail the Golden Obi! A new year is here! It&apos;s time to look forward, establish strong resolutions, and set goals for 2014. In the midst of such hefty tasks, it&apos;s important to look back at 2013 and reflect on the year&apos;s achievements. At Bodybuilding.com, that means it&apos;s time to sort through an immense library of content—articles, videos, transformations, BodySpace galleries, and more—to compile the annual Bodybuilding.com Site Awards! Selecting the award winners is no easy feat. We published more than 2,000 new articles and transformations in 2013. We released six video trainers and dozens of video articles. BodySpace has more members than ever, and the Forums now have more than 100 million posts. In short, there&apos;s a lot of great content on Bodybuilding.com, which makes this one tough gig. To choose the winners, we clicked through page after page of outstanding article content, gazed at galleries of seriously shredded guys and "she&apos;s so hot I might just die" fitness girls, canvassed industry experts, scoured the Forums, debated, gathered feedback, got in three fistfights, took a bench press break, and finally agreed on the following content and community choices. Congratulations to our winners! If you disagree with any of our selections, or simply want to share your own favorites from 2013, post comments and links in the comments section below! Frank is more than a gentle giant. He&apos;s a ridiculously ripped tower of muscle with a heart of solid gold! Frank had a big transformation, but his presence on BodySpace is even bigger. He coordinates events, promotes contests, and helps members daily. He&apos;s got personal goals and a global reach. Ashley Swoboda is an NPC competitor and gym owner who smashes weights and inspires others. She&apos;s helped hundreds of friends and strangers find their way on BodySpace. Her strength, beauty, incredible physique, and killer training clips keep the community motivated. Adam Charlton looks like Ryan Gosling&apos;s ripped older brother. His photo gallery basically speaks for itself. Check out the 90-plus images on Adam&apos;s BodySpace page, and you&apos;ll understand the meaning of "cut and jacked." Charlton keeps the complete physique year-round. Jen Jewell&apos;s gallery is a BodySpace gem. With over 170 images, it&apos;s an incredible reflection of what it means to live fit every single day. If pictures of this WBFF athlete don&apos;t immediately stop your heart, they&apos;ll definitely motivate you to train harder and crush your goals. Jesse has been fighting fat from a starting weight of 660 pounds. With discipline and support from the Bodybuilding.com community, he&apos;s already lost 100 pounds and regained his ability to walk. "Wetty B" is one of the most inspiring people on our site. Yes, "OP is going to make it!" Vox has been an active Forum member since 2009. He&apos;s a global moderator known best for his helpful sticky threads, including five in the Exercises section. Vox keeps the boards clean and always delivers solid advice to new users. Jacob Wilson&apos;s "Ask the Muscle Prof" column is like a scatter-gun for misinformation; he shoots down myths and urban legends like clay pigeons. The PhD&apos;s professorial language is easily understood by those of us without all those creds. You&apos;ll see a lot more of the good doctor in 2014. Bro-science, beware. Anna Sward of proteinpow.com gives lie to the notion that eating clean means deprivation. In Houdini-like fashion, she takes our greatest dietary indulgences—Pancakes! Cannolis! Brownies! Cheesecake!—and turns them into protein-packed yummy-ness. Anna, our taste buds, and our muscles, thank you. BPI Sports co-founder James Grage didn&apos;t just survive a brutal car accident. He rebuilt himself into a stronger and better man, and his story rang true with our readers. Prepare for your jaw to drop and your motivation to skyrocket. If you don&apos;t know where you&apos;re going, any plan will serve. But if your destination of choice is increased strength with the muscles to match, you need a solid foundation in exercise programming. Take a lesson from Chris Smith and then take his eight-week challenge! 50 Cent&apos;s success is real, and so is the perspective he&apos;s worked hard to attain over the years. This rapper and entrepreneur has a lot to teach you about success in and out of the gym. Lend him an ear! Every body is a work of art. We took photos of 12 of the best physiques in the world to highlight the human body&apos;s beauty, power, and potential. Enjoy this collection of 36 jaw-dropping, thought-provoking photos and get inspired to build your best body. The reign of egg whites and oatmeal is over; the age of Kevin Alexander and his insanely delicious muscle-building breakfasts has come! From french toast to breakfast parfaits, these recipes pack the macronutrients you need to recover and rebuild. Calculating the amount of protein, carbohydrate, and fat you eat can be an essential but daunting task, but not if you have the right model. If you&apos;re tired of doing big-time math to get big-time gains, this article will simplify your nutrition without impacting your results. This superfeature offers your sickly shoulders the medicine they need to transform from turnips into cannon balls. Grab some dumbbells and pull up one of these articles. You&apos;ll learn how to complete your fit body with bigger, rounder, healthier shoulders! Fitness competitions are difficult, but they can be devastating if you don&apos;t have the right perspective. Abby Huot will tell you, win or lose, that you already possess the most important trophy of all, one that&apos;s on display 24/7: your new body. Some researchers thought they had a whopper on the line when they linked fish oil to prostate cancer. The mainstream media gave their suspect study top billing, but our supplement guru Dr. Jim Stoppani broke it down for the fish story it was! Want to lose weight and gain muscle? Eat clean and lift consistently. Want to lose weight, gain muscle, and walk through life feeling stronger and more confident than ever? Follow Sohee Lee&apos;s 10 rules—no exceptions! Kris Gethin and leg day—the combo goes together about as well as bad seafood and a ride on choppy ocean seas. To quote the man himself: "Think you have what it takes to keep up? Swallow your fear, swallow your bile, swallow your pride, and start lifting." Living Large is unlike anything you&apos;ve seen before. It&apos;s a documentary coupled with an eight-week training program from one of the best bodybuilders in the business. You&apos;ll learn how to lift, eat, supplement, and live like legendary bodybuilder Jay Cutler. David Otunga is an incredibly accomplished guy. He&apos;s a WWF fighter, lawyer, reality television star, and actor. As if that&apos;s not enough, he&apos;s also ripped up, strong, and passionate about fitness. We&apos;re not sure it&apos;s possible for him to be more inspiring! Body Transformation: Robins Dorvil Set An Exercise Example! Robins believed that he was born to be fat from birth and watched his son helplessly follow the same unhealthy pattern. To give his son guidance and direction, Robins lost 30 percent body fat and turned himself into a ripped role model! Brandy&apos;s medical background gave her an advantage when she needed to repair her body after years of junk-food binges. This physician-turned-bikini competitor looks like a different person after shaving 61 pounds and 28 percent body fat from her physique! Carter&apos;s defining moment came when he could no longer walk up stairs without taking a breather. He immediately enlisted the help of his mother, who had healthful nutrition knowledge. He torched 100-plus pounds in one year! Carrie gave up on fitness after birthing twins, but she experienced a resurgence at age 39 while watching her children take Taekwondo. She immediately got into the action and let her newfound passion snowball to single-digit body fat! Alex left college soccer to become a professional bodybuilder and worked tirelessly to develop a physique with proper proportions, symmetry, and size. Now the Oregon native plans to hijack the NPC podium on his path to IFBB supremacy! Laura started bodybuilding to regain control of her life after a devastating battle with anorexia. The steady dose of healthy food and heavy weights quickly crushed her lifelong insecurities and started her on a path to competition success! Tyler made a difficult decision to pass up college football and become a professional bodybuilder. To ensure that he would see it through, he trained with IFBB pro Vinny Galanti and now weighs 215 pounds at age 19! Fitter Than Ever At 41! Michelle loves challenges and thrives in the fitness arena that came natural to her. When her 40s approached, this gourmet cook kicked it into high gear and torched her goals so she could sizzle onstage! Enmeri Batista has pro figure goals, but for now the Air Force is her calling. This nine-year vet struggled to put on muscle, but she&apos;s slowly gained it the smart way. She sets an honorable example for military members! Simone beat back depression and anxiety, added muscle to her underweight frame, and found a life that&apos;s happier and healthier. She has serious plans to represent Australia in the IFBB and will work relentlessly to make it true!